Maritime Communication is a luxury when traveling inland on the intracoastal waterway but a necessity on the open seas. Marine VHF & Marine Radio used to be the only game in town for maritime communication. VSAT Internet is the most reliable form of communication on the high seas. Vsat Internet can be complex during setup but once it is up and going you have nothing but smooth sailing. VSAT service uptime is upwards of 99%. If you need help with installation of your internet and communication call Marine Electronic Installers. VSAT marine internet and communication delivers high speed, broadband satellite communication for your vessel via internet and a VPN (Virtual Private Network). VSAT works on all types of vessels: Freighters, Work Boats, Tugs, Barges, Oil Platforms, Pleasure Boats, Center Consoles, Cruise Boats, Sport Fish Boats, Super Yachts, Mega Yachts, etc… Every type of boat can incorporate this use anywhere technology. Having high speed broadband internet connection in any locale is probably one of the largest breakthroughs for the maritime industry. You never have to be far away from your family or work. With Vsat internet distance is no longer an issue no matter how remote your location. Having VSAT internet is the best and easiest way to connect remotely for pleasure or work. You can easily stay in touch with work or run your business with web access, email, video transmissions, VOIP (Voice Over IP) phone, and any other scope of work related to being online. With VSAT internet you can mix business and pleasure. Marine Electronic Installers will ensure that your maritime communications are comparable to your home or business. During setup some complicated terminology will be thrown around (Ku, Ka, C Band VSAT, Sat Phone, Inmarsat Communications, Inmarsat System, Service Offerings, ‎Teleport and NOC, ‎Coverage Area, ‎Satellite Internet service, FleetBroadband, satellite communication, maritime telecommunications, maritime radio communication, vhf radio communication, internet at sea, vsat technology). A combination of products and services provided by marine industry stalwarts will guarantee the most secure setup with almost zero downtime. Intellian, KVH, Inmarsat, Sailor, Aigean, Cisco/LinkSys, Luxul, Ubiquiti, Wave Wifi, Inmarsat Isatphone Pro, TracVision, Iridium Phone, Fleet One & Fleet Xpress. Inmarsat developed Fleet Xpress to deliver higher speeds and higher capacity of data delivery with the most connectivity available to commercial fishing sector along with offshore support for all shipping companies with around the globe satellite communication. Vsat internet is perfect for all vessels of all sizes. Deep sea ocean going merchant vessels require the dependability of Vsat. Coastal merchant vessel also required around the clock connectivity and inmarsat is the perfect choice for staying connected. SMS text message service function the same as on land. Commercial fishing vessels of all size are now using this technology to stay abreast of the latest prices and markets plus being in touch with your family is priceless. Recreation boats and yachts are easily the largest users of this technology. Nothing exceeds like excess on your boat but having these services provides many layers of functions. Entertainment for guest and crew is perhaps the most widely used aspect of having VSAT internet but in emergency situation you can contact multiple authorities and towing services. Call Marine Electronic Installers if you have any questions concerning maritime communication. 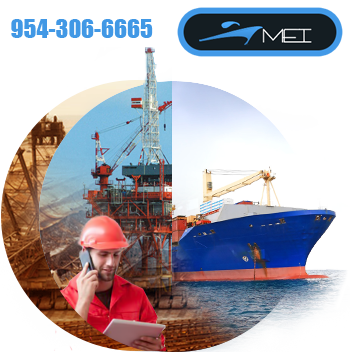 MEI helps will assist you with choosing and setting up your maritime communications.